The 35th Infantry Regiment Association salutes our fallen brother, PFC Emory Stephen Cannon, who died in the service of his country on January 11th, 1968 in Quang Tin Province, Vietnam. The cause of death was listed as Accidental Self-Destruction (Dud Mortar Exploded). At the time of his death Emory was 21 years of age. He was from Plant City, Florida. 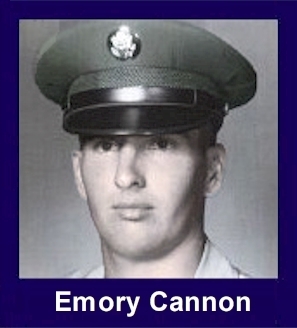 Emory is honored on the Vietnam Veterans Memorial at Panel 34E, Line 28. The decorations earned by PFC Emory Stephen Cannon include: the Combat Infantryman Badge, the National Defense Service Medal, the Vietnam Service Medal, the Vietnam Campaign Medal and the Vietnam Cross of Gallantry with Palm Unit Citation. Emory was in the weapons platoon. At LZ Baldy, he was carrying a mortar illumination round when it detonated for unknown reasons. Emory was awarded an ARCOM for Merit. Emory is buried at the Turkey Creek First Baptist Church cemetery in Plant City, FL. He graduated from Turkey Creek high school in Plant City where he was interested in sports. Emory was well-liked by his friends, had high moral standards, and respected other people's property and rights.